"Choosing Mental Illness", the new video from PHILIP H. ANSELMO & THE ILLEGALS, the project led by the former PANTERA and current DOWN/SUPERJOINT frontman, can be seen below. The clip was inspired by the classic 1975 film "One Flew Over The Cuckoo's Nest", which won five Academy Awards, including "Best Picture" and "Best Director." 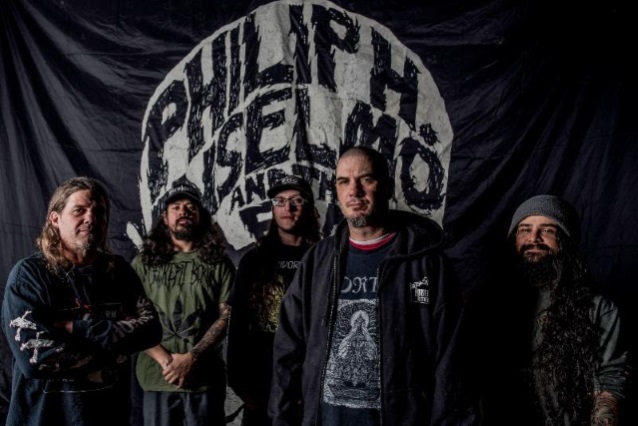 "Choosing Mental Illness" is taken from PHILIP H. ANSELMO & THE ILLEGALS' sophomore album, "Choosing Mental Illness As A Virtue", which was released in January via Anselmo's Housecore Records in the U.S. and Season Of Mist in other parts of the world. The disc is the follow-up to PHILIP H. ANSELMO & THE ILLEGALS' debut, "Walk Through Exits Only", which came out in 2013 to mostly positive reviews. "This video is based on one of my favorite films about the harshness of mental illness," Anselmo said in a statement. 'Being up close and personal with the struggle, I often feel like R.P. McMurphy, who I play in the clip. "I've had a lot of questions about the LP title, 'Choosing Mental Illness As A Virtue', and songtitle, 'Choosing Mental Illness'," he continued, "but make no mistake, I take mental illness very seriously, especially because it often goes untreated. We've taken some extra steps at the end of the video with information that you, or someone close to you, might need. "On a lighter note, it's always a blast to do creative things like the video with my band, crew, and family," Anselmo added. "Bringing Michael St. Michaels into the fold was like having your favorite wacky uncle over for the holidays! He did a great job as our version of Nurse Ratched and he's an absolutely lovable and talented guy." As previously reported, PHILIP H. ANSELMO & THE ILLEGALS will unite with Housecore labelmates KING PARROT this fall for a U.S. live takeover. The trek, previously scheduled for the spring but postponed following Anselmo's recent back surgery, will commence September 6 in New Orleans, Louisiana and includes a stop at this year's edition of Berserker Fest on September 28 in Pontiac, Michigan.